I want you to become a keyboard shortcut master. If you know the keyboard shortcuts and understand their functions, you’ll be a faster video editor. That means you finish projects sooner, get paid faster and make your bosses and clients happier. When I was learning Media Composer I wish I had a way to check my progress. I didn’t. I didn’t have a teacher. I couldn’t afford a class. There were no lessons to follow. Lynda.com didn’t exist and YouTube was unreliable. I just plugged away each day, screwing up and knocking clips out of sync, until I eventually got to a place where I believed, “I think I finally understand all this.” Not knowing your skill level is rough, especially if you’re new to an industry or software. You don’t have to go through that pain and mystery like I did. This is why I have created the Mastering Avid Media Composer’s Keyboard Shortcuts Exam. The exam is 70 questions and takes place right here on EVF. If you’ve taken any of my free Media Composer quizzes the format will be familiar. Please take a crack at a quiz so you know what to expect for the exam. The multiple-choice exam will cover everything in the Mastering Avid Media Composer’s Keyboard Shortcuts lessons. To do well on the exam you need to know what the keyboard shortcuts are and how their associated functions work. Before we go any further, please remember that I have no affiliation with Avid. I’ve written for their blog before but that is it. They do not compensate me and this exam is purely based on my experience with Media Composer. Cool? The exam costs $5. Less than a burrito bowl at Chipotle. If you study the shortcuts, take the exam and feel that it wasn’t what you expected and you now hate me and feel wronged, I’m happy to issue a refund. I’m positive that will not happen though. Once you purchase the exam you’ll download a document (an .rtf file which can open in Notepad, Word, etc.) with instructions that will direct you to the exam URL and the password to access it. Go to the page, enter the password, enter your first and last name and your email address. This email address is how I will follow-up with you about your results and is just for me to congratulate you. Take the exam. You’ll get your results right away and I’ll message you within a few days to chat about how you did. Once you get a great score you can relish in the fact that you’re a keyboard shortcut master. If you are not pleased with your score you are free to retake the exam as many times as you want within a week. Each week I change the password and if for some reason you are locked out or have any trouble getting in message me here and I’ll get you in as soon as possible. To purchase access to the exam click the “Buy Now” button below. Once again it is $5. You can use PayPal or a credit card. After that you will be prompted to download a document with instructions. Message me here (or email me – josh@editvideofaster.com) if you have any issues. If you’ve been around here on EVF for a while you know that I’m completely honest with you. I believe this exam is a fantastic way to test your Media Composer chops. It’s something that I wish I had years ago and that’s why I’ve created it for you. Spending the equivalent of a venti vanilla latte in order to gain knowledge and confidence in your career is a no-brainer to me. If you have any questions whatsoever email me or use my contact page. I’m happy to answer any questions you have about the exam. This is the ninth and last lesson in a series on mastering Avid Media Composer’s keyboard shortcuts. Each lesson tackles a handful of shortcuts. By the end of all the lessons you should be flying through your editing sessions. This lesson focuses on everything else not in the other lessons! There are shortcuts that just don’t fit into any one group and groups of shortcuts I didn’t want to dedicate an entire lesson towards. Well, here they are! If you see any that I’ve missed over the past nine lessons, please let me know in the comments and I’ll add them in. If you look at the image below, you’ll see the Source and Record Monitors. Source is on the left and Record is on the right. The Timeline or the material that’s loaded in the Monitor is represented by the white or gray bar beneath the player. When that monitor is active, meaning you can hit keyboard shortcuts like J, K, L, 1, 2, 3, 4, 5, 6, Home, End, Space Bar, D, F, G, etc. and it’ll do something, the bar is white. When it isn’t active, it’s gray. Only one will be active at a time. In the example below the Record Monitor is active. Hitting the escape key will switch between the two Monitors. You don’t have to click back and forth when you are deciding on In/Out Points in the Source Monitor and down in the Timeline. Try this one out if you haven’t used it before! This is pretty straightforward. Just like in pretty much any program out there you can undo an action you just made. Keep hitting this shortcut to undo further and further back. If you undo too far backwards, use this shortcut to go forwards an undo step. This shortcut opens the Find tool. This shortcut enters Full Screen Playback mode. 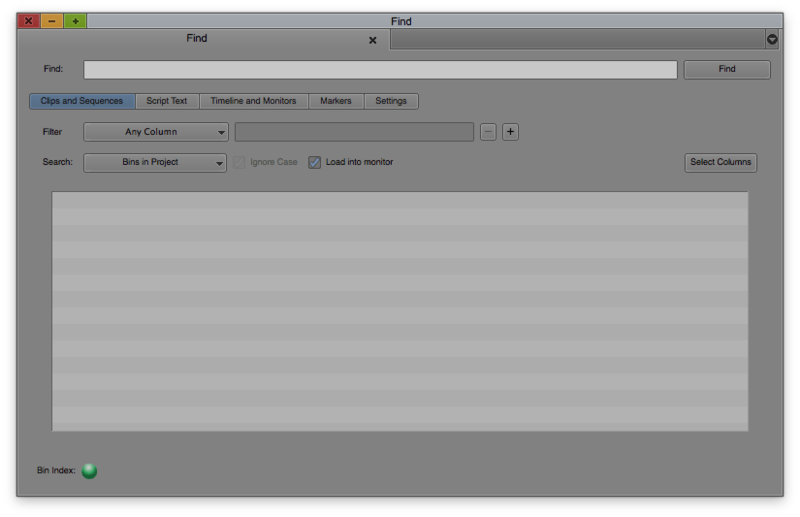 In the Title Tool use this shortcut to align the text or object horizontally (left and right) across the screen. Basically this centers the text or object along an imaginary Y-Axis running down the middle of the Title Tool. In the Title Tool this shortcut aligns the selected object(s) to the bottom of the frame. This will send a selected object, including text, back in the stacking order. This is important when you are placing objects on top of each other. This will send a selected object, including text, forward in the stacking order. This is important when you are placing objects on top of each other. Holding Opt or Alt and clicking text will switch between the Selection Tool (how you move the text around the Title Tool) and the Text Tool (how you type in text). This shortcut bolds selected text. This shortcut italicizes selected text. This shortcut adds a soft drop shadow to selected text or objects. This shortcut duplicates a selected object. This shortcut will allow you to save your title. Use this shortcut to enter MultiCam Mode. This shortcut uses MultiCam 1 when in MultiCam Mode. This shortcut uses MultiCam 2 when in MultiCam Mode. This shortcut uses MultiCam 3 when in MultiCam Mode. This shortcut uses MultiCam 4 when in MultiCam Mode. This shortcut uses MultiCam 5 when in MultiCam Mode. This shortcut uses MultiCam 6 when in MultiCam Mode. This shortcut uses MultiCam 7 when in MultiCam Mode. This shortcut uses MultiCam 8 when in MultiCam Mode. This shortcut turns on or off the Smart Tool. This shortcut turns on or off the Segment Mode (Lift/Overwrite) (the Red Arrow) in the Smart Tool. This shortcut turns on or off the Segment Mode (Extract/Splice-In) (the Yellow Arrow) in the Smart Tool. This shortcut turns on or off the Overwrite Trim (the Red Trim Roller) in the Smart Tool. This shortcut turns on or off the Ripple Trim (the Yellow Trim Roller) in the Smart Tool. This shortcut turns on or off Keyframes. This shortcut turns on or off Link Selection Toggle. This shortcut marks an Audio In Point. This shortcut marks an Audio Out Point. This shortcut moves the Time Position Indicator to the Audio In Point. This shortcut moves the Time Position Indicator to the Audio Out Point. This shortcut marks an In and Out Point around the nearest Markers. I actually learned this one while making this lesson. On various tools you can use this shortcut to jump to that tool’s settings. If you move a window like a tool to a different part of the screen and want to move it back to where it is set in the workspace, use this shortcut. That’s all the shortcuts for Lesson 9 of Mastering Avid Media Composer’s Keyboard Shortcuts. What’d you think? Learn anything new? Give me a shout if you have any questions. Leave me a comment below, message me through the contact page or send me an email – josh [at] editvideofaster.com. Please, if you found these lessons helpful I’d love for you to go to this page so we can stay in touch. There will be many more useful posts, videos, tutorials, guides and more to help you in your editing adventures and this is the best way to find out about them. This is the eight lesson in a series on mastering Avid Media Composer’s keyboard shortcuts. Each lesson tackles a handful of shortcuts. By the end of all the lessons you should be flying through your editing sessions. This lesson focuses on the timeline. Hey real quick. If you missed my announcement about the Mastering Avid Media Composer’s Keyboard Shortcuts Exam, you can find it here! The timeline is where all the magic happens in Media Composer. The shortcuts that follow will speed up your editing, guaranteed. One of my favorite milestones when I was learning Media Composer was when I started incorporating all the different zooming options available. I found myself flying through my edits faster each day as I got more comfortable with them. The shortcuts in this lesson are some of my favorites. Alright, here we go! This shortcut will zoom the timeline in. Use this instead of the zoom bar at the bottom of timeline. For what it’s worth, I prefer to change this to Shift+]. This shortcut will zoom the timeline out. Use this instead of the zoom bar at the bottom of timeline. For what it’s worth, I prefer to change this to Shift+[. One other note. I will quickly hit Cmd/Ctrl+[ then Cmd/Ctrl+] to re-center my timeline. When you use the shortcut for More Detail or Less Detail the timeline re-centers around where the Time Position Indicator (the blue bar in the timeline) is. This is quicker than reaching over to the mouse and pulling the scroll bar at the bottom of the timeline. If you’re zoomed in, this shortcut will zoom you out to show the entire sequence. I like to change this to Shift+\ so it’s next to what I changed More Detail and Less Detail to. When you hit this shortcut your mouse will change to two arrows facing opposite directions with a rectangle in the middle. Decide where you want to zoom in and where you initially click that’ll be the start of the new timeline view and while holding the mouse down drag to where you want the new timeline view to end. I love this shortcut. I change this shortcut to Shift+= so it’s near my other timeline zoom shortcuts. Whatever track(s) is selected (aka active) when you use this shortcut the track will shrink in height. This only affects your view of the timeline and doesn’t affect any of the clips. This shortcut creates a new video track. If you only have tracks V1 and V2, using this shortcut will create V3. Use it again to create V4. This shortcut creates a new mono audio track. This shortcut creates a new stereo audio track. If you want to create a new track at a custom track number, use this shortcut. For example if you have V1 and V2 as video tracks but want to create V9, use this shortcut. A box will pop up for you to select what kind of track and what track number to put it on. Hold Cmd/Ctrl and drag the mouse across the timeline. This will snap the Time Position Indicator to head frames (the first frame of a clip). This is another shortcut that I absolutely love. Hold Cmd+Opt/Ctrl+Alt and drag the mouse across the timeline. This will snap the Time Position Indicator to tail frames (the last frame of a clip). That’s all the shortcuts for Lesson 8 of Mastering Avid Media Composer’s Keyboard Shortcuts. What’d you think? Learn anything new? Ready for Lesson 9? Click here (or the image below) to go to it. Please note the pre-sale is now over. Please visit this page for more information on the exam. If you haven’t noticed, I’ve been creating a bunch of lessons about Media Composer’s keyboard shortcuts and their related functions. This is because I want you to become a keyboard shortcut master. If you know the keyboard shortcuts and understand their functions, you’ll be a faster video editor. That means you finish projects sooner, get paid faster and make your bosses and clients happier. When I was learning Media Composer I wish I had a way to check my progress. I didn’t. I didn’t have a teacher. I couldn’t afford a class. There were no lessons to follow. I just plugged away each day, screwing up and knocking clips out of sync, until I eventually got to a place where I believed, “I think I finally understand all this.” Not knowing your skill level is rough, especially if you’re new to an industry or software. You don’t have to go through that pain and mystery like I did. I’m in the process of creating an exam to solve this very issue. It will be a simple, convenient and affordable way to test your abilities with Media Composer’s keyboard shortcuts. The exam will be launching February 13th (my birthday!). It will take place here on EVF. If you’ve taken any of my free Media Composer quizzes the format will be familiar. Please take a crack at a quiz so you know what to expect for the exam. The multiple-choice exam will cover everything in the Mastering Avid Media Composer’s Keyboard Shortcuts lessons. There will be two more lessons released before February 13th. To do well on the exam you need to know what the keyboard shortcuts are and how their associated functions work. Your results, if you choose, will be displayed on the leaderboard. On the leaderboard you’ll have the opportunity to link to your website, demo reel or piece of work you’ve done. The leaderboard will be in order by score then by date. The first person that gets 70 out of 70 will be at the top of the leaderboard permanently. So that means if you want to be near the top you better 1) study the lessons and 2) take the exam before others do. The exam will cost $35. I want anyone attempting the exam to take it seriously. I want you to study and master the keyboard shortcuts. If you study the shortcuts, take the exam and feel that it wasn’t what you expected and you now hate me and feel wronged, I’m happy to issue a refund. I’m positive that will not happen though. Once you purchase the exam you’ll download a document with instructions that will direct you to the exam and the password to access it. Go to the page, enter the password, enter your first and last name and your email address. This email address is how I will contact you about the leaderboard. Take the exam. Get a great score because you studied and relish in the fact that you’re a keyboard shortcut master. If you are not pleased with your score you have one week to retake the exam. A few days following your completion of the exam I will email you to get the link to your website, demo reel or piece of work you want associated with your name on the leaderboard. If you do not want to be on the leaderboard you can opt out; just let me know! I will be emailing you from josh@editvideofaster.com. The exam will go live on Saturday February 13th. It will be $35. I am doing a special introductory offer of $15 if you purchase before Friday January 22nd, 2016 11:59 EST. The price will never be this low again. To get this deal click the “Buy Now” button below. You can use PayPal or a credit card. After that you will be prompted to download a document with instructions. Please email me at josh@editvideofaster.com (this is reiterated in the document) saying you’re part of the pre-sale for the exam! I should get your email address when you make the purchase but I want to make 100% sure I have it to send you access to the exam once it is launched. Once it’s launched I’ll send you the link to the exam with your password. If you’ve been around here on EVF for a while you know that I’m completely honest with you. I believe this exam is a fantastic way to test your Media Composer chops. It’s something that I wish I had years ago and that’s why I’ve created it for you. If you have any questions whatsoever email me or use my contact page. But remember you have until January 22nd, 2016 to get the exam for only $15, more than 55% off. This is the sixth lesson in a series on mastering Avid Media Composer’s keyboard shortcuts. Each lesson tackles a handful of shortcuts. By the end of all the lessons you should be flying through your editing sessions. This lesson focuses on selecting (or deselecting) tracks. Let’s get started! The next several shortcuts will either select (activate) or deselect (deactivate) a track(s). In the image below tracks V1-V5 are selected (or active) and all the rest of the tracks are not selected (or deselected or deactivated). Make sense? I feel like a broken record saying all these shortcuts are important, but I find I use most of these shortcuts all the time. Hitting 7 will select or deselect Track V2. Hitting 8 will select or deselect Track V1. Hitting 9 will select or deselect Track A1. Hitting 0 will select or deselect Track A2. Hitting – (aka Minus aka Dash aka Hyphen) will select or deselect Track A3. Hitting = (Equals) will select or deselect Track A4. With the Timeline window active, this shortcut will select all tracks in the Timeline. With the Timeline window active, this shortcut will deselect all the tracks in the Timeline. That’s all the shortcuts for Lesson 6 of Mastering Avid Media Composer’s Keyboard Shortcuts. What’d you think? Learn anything new? Give me a shout if you have any questions. Leave a comment below, message me through my contact page or send me an email – josh [at] editvideofaster.com. Ready for Lesson 7? Click here (or the image below) to go to it. This is the fifth lesson in a series on mastering Avid Media Composer’s keyboard shortcuts. Each lesson tackles a handful of shortcuts. By the end of all the lessons you should be flying through your editing sessions. This lesson focuses on modes, trimming and slipping. Let’s get started! Source/Record Mode is the mode you’re going to be in for the most part. This shortcut doesn’t do much unless you are not in Source/Record Mode. This shortcut will leave whatever mode you’re in and put you into Source/Record Mode. Hitting U will enter you into Trim Mode putting rollers around the nearest edit point to the Time Position Indicator on the selected tracks (did you follow that?). By default you’ll have the double pink rollers. This means when you add to one side you subtract from the other. Another way to think about the double pink rollers is that you are not adding any time to the track and/or sequence (see Lesson 4’s section on Locked vs. Unlocked tracks). Note that hitting U again will exit you from Trim Mode. 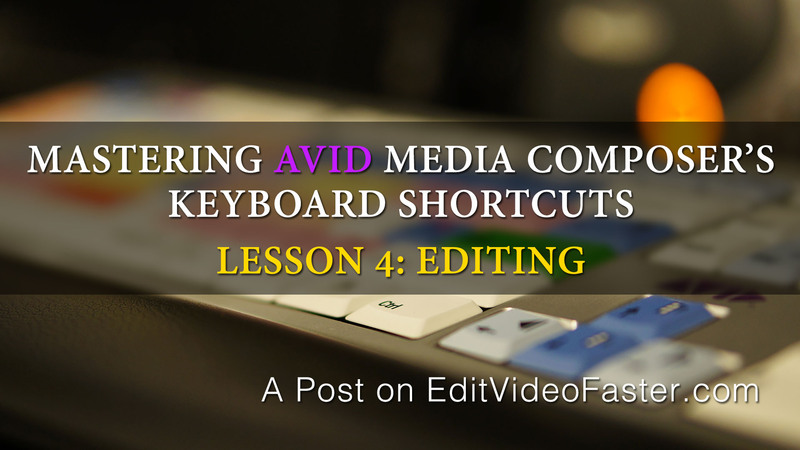 This is the fourth lesson in a series on mastering Avid Media Composer’s keyboard shortcuts. Each lesson tackles a handful of shortcuts. Those shortcuts should be practiced until the next lesson in a few days. By the end of the lessons you should be flying through your editing sessions. This lesson focuses on editing. By editing I mean putting clips in and removing clips from the timeline. There’s only a few shortcuts in this lesson but they’re some of the most valuable and useful functions in Media Composer. Let’s get started! PS – There’s a pop quiz that I need you to give me an answer to at the end of the lesson. Before we get started I want to give a quick rundown on locked vs. unlocked tracks. If you are familiar with these already then skip ahead. If not, I recommend reading this section. You have the choice to lock or unlock a timeline track. I strongly recommend locking your tracks. In fact, I pretty much only edit with my tracks locked. There are a handful of times where it’s more useful for me to unlock them but 99% of the time they’re locked. There’s a rectangle on each track in between the track name and the monitor box (see image). When it’s highlighted and there’s a black slanted rectangle thing in it then the track is locked. If it isn’t highlighted and there isn’t a black slanted rectangle thing then it is unlocked. Tracks are unlocked by default. When you “lock a track” in After Effects it means you cannot make any changes to it. That’s not what this is in Media Composer. 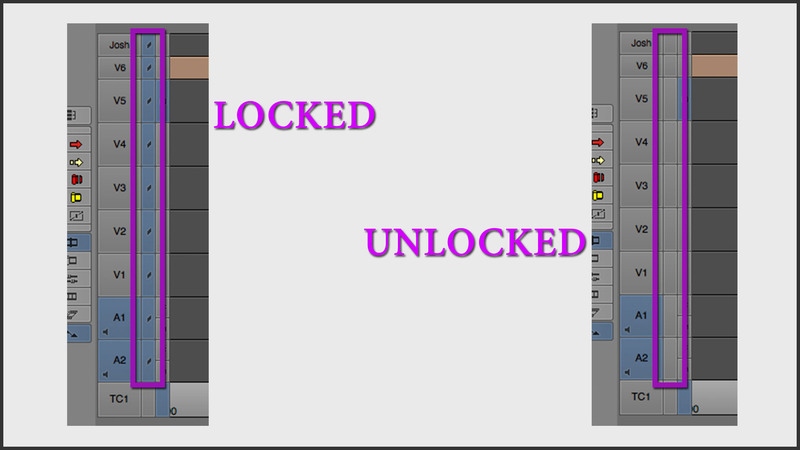 Locking tracks syncs the given timecode for all locked tracks, locking them together so if you make changes (i.e. adding or removing time to a track by editing in or editing out a clip) to one then you make changes to them all. Locking tracks keeps you from unintentionally knocking your timeline out of sync. It takes a minute (or a couple weeks) to wrap your head around it but IMO it’s the safest, quickest and best way to edit. Leave me a comment if you’re confused about anything. This is the second lesson in a series on mastering Avid Media Composer’s keyboard shortcuts. In each lesson we tackle a handful of shortcuts that should be learned and practiced until the next lesson in a few days. This isn’t just any list of shortcuts. For many of them I’ll explain how they work and how I use them everyday as an editor. Lesson 1 was on Media Composer’s Tools. Lesson 2 is on Marking and Playing. These are some of the most basic shortcuts I want you to learn. 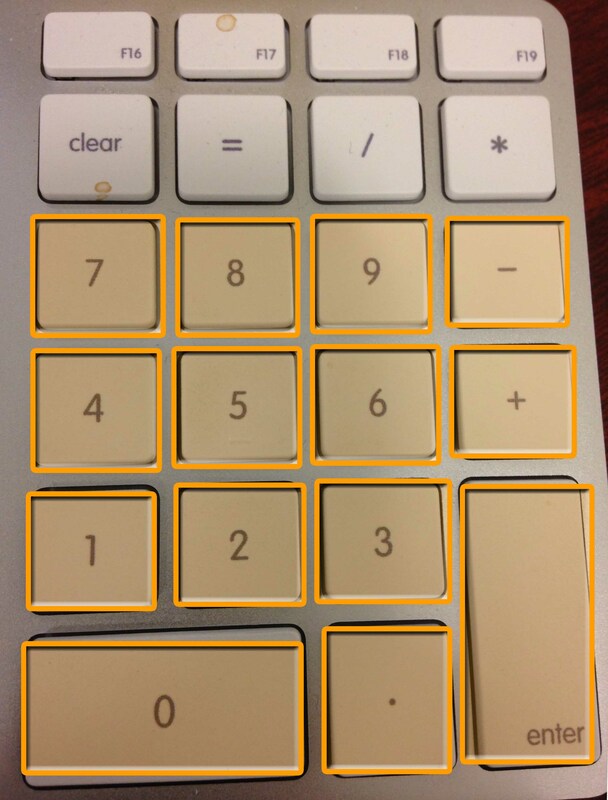 Some other shortcuts (Z, X, V, B, etc.) you can do damage to your timeline by accidently doing something you weren’t expecting. With these shortcuts the worst thing you can do is clear an In or Out Point. Let’s get started! Marking an In Point is one of the must learn keyboard shortcuts. Media Composer works on three-point editing. Basically you need two In Points and an Out Point or vice versa. Put an In and Out Point on the clip in the Source Monitor then an In Point on the Timeline then hit Splice-In or Overwrite Edit and the clip from the Source Monitor gets edited onto the Timeline. Kind of make sense? There’s a bit of a hierarchy when it comes to In and Out Points and three-point editing but that’s for another lesson. Even though I stand up here on my soapbox preaching about how important keyboard shortcuts are you will still use the mouse. It’s inevitable. So if you’re right-handed you will generally have your left hand on the keyboard. If so you’ll find you use “E” way more than “I” to mark an In Point. I however am I lefty so my right hand is always on the keyboard. That means I use the “I” key to mark an In Point more often. The same goes with our next shortcut.